Apparently, I've had a few brain farts lately. I made this card for last week's TSG challenge and never posted. Yup, I'm a nut!!! I made it for last week's "Green" challenge. It definitely has a St. Patrick's Day feel to it. For my card, I used the TSG set called "Blessings" that was stamped with Archival black ink. 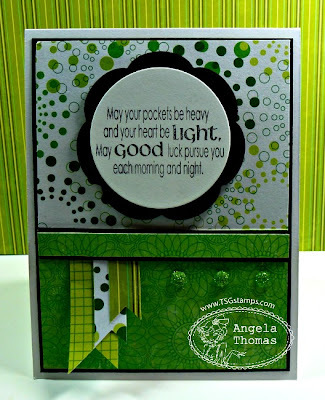 What a sweet Irish Blessing card for St. Paddy's Day! Just Perfect!